Why is it so Darn Expensive? I often get asked what is saffron and why is it so expensive? And the blunt answer is: because it's so darn backbreaking and labour intensive to harvest! The delicate orange-red stigma of the saffron flower (Crocus sativus) is harvested by hand with only three thin strands available in each small flower. More on Exactly "What is Saffron"
Each of these saffron strands (stigma) is thread-like and measures less than 4 centimetres in length. And considering that it takes up to 75,000 flowers growing in football sized fields to produce a single pound, it is easy to see why this particular spice is so expensive. The pretty saffron plant is grown in many countries, ranging from Spain, Italy and Greece to India, with Iran leading the way producing more than 90 per cent of the world’s supply. More on the plant. Native originally to Asia, the use of saffron spread along the spice route into Europe and India and China, where it's been cultivated and used for more than 4,000 years as a flavouring, a treatment of illnesses, and as a dye. Read more on the history of saffron. The unique flavour and fragrance come from the chemicals picrocrocin and safranal and its golden yellow shade comes from the chemical crocin. The delicate strands can be soaked in any liquid, such as broth, water or wine, and then added to food, such as rice, to give it a delightful light flavour and colour. A cheaper alternative often used is turmeric spice and, whilst you'll get the right colour, it will not replicate the fresh flavour. And like turmeric, this spice is still widely used around the world as a fabric dye, particularly in China and India. It's extract is also used in modern medicine for its anti-cancer properties and antioxidant properties. 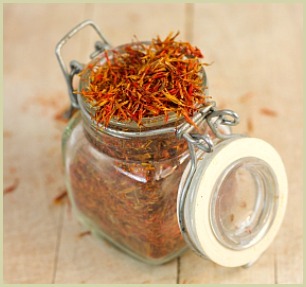 If you're interested, click here to read more about saffron extract. So, now you may have the answer to what is saffron, but you may be wondering is it worth it? I'd say yes! While it may be expensive, stored in a cool dry place, a little goes a very long way.